Ask any woman about her experiences with pain and the healthcare industry, and you’re likely to hear stories like mine. It was only an hour after I took the first antibiotic pill for a sinus infection that I knew something was wrong. I was lying on the couch reading when I suddenly had the urge to throw up. I only made it as far as the kitchen sink before my breakfast came up. Figuring the antibiotic just hadn’t jived with my tummy, I took some Pepto and curled up in bed. Five minutes later, I was in the bathroom, heaving up the Pepto. After I was done rinsing out my mouth, I stumbled back to bed and slept for an hour, waking up to legs that felt like lead and ached fiercely. I carefully made my way back to the living room, sat down on the couch, and contemplated my situation. In the blink of an eye, I was at the kitchen sink again, violently vomiting bile and struggling to breathe. Ten minutes passed before I was able to pull myself together enough to call my dad and request a ride to the emergency room. In the 20 minutes it took him to get to my house, the pain in my legs became so great that I was sobbing. It was so bad that my dad had to act as a human crutch as he helped me hobble into the hospital. I explained that I had taken a new antibiotic and was fairly certain I was having an adverse reaction to it. I was given anti-nausea medication and a bag of saline. I asked the nurse practitioner who was assigned to my case if the fluids would help with the pain in my legs. She said they would. After the entire bag of saline had made its way into my veins, I let her know that the pain was still present (as the tears on my face attested). She then told me that it was my anxiety causing the pain, and gave me lorazepam — a sedative. I cried silently for an hour, angry at myself for not fighting her ridiculous diagnoses and trying desperately to ignore the pain. When she returned, I told her that I was still very much in pain and that I needed something for it. It was only then that she gave me an analgesic. As she worked on my discharge papers, she told me that my symptoms were a result of anxiety and sciatica. Not only has my anxiety never presented in such a way, I was amazed that she thought this “sciatica” just magically appeared the day I took a new antibiotic and disappeared once it was out of my system. A cursory Google search revealed that every symptom I had — including the horrible muscle pain — were indicative of an adverse reaction to the specific antibiotic I had taken. She hadn’t even bothered to look. To her, my pain was nothing more than hysterics. I wish I could tell you this was a unique experience. In reality, this is the fourth time in my life a doctor has ignored my real, physical pain and chalked it up to being nothing more than a mental health issue. And, unfortunately, I’m not the only woman who has had to endure such an ordeal. As if we didn’t have enough inequalities to deal with on a daily basis, women have to fight tooth and nail to get doctors to take their pain seriously. Ask any woman about her experiences with pain and the healthcare industry, and you’re likely to hear stories like mine. But it’s not just anecdotes that point to a long history of medical professionals dismissing women’s pain — there’s plenty of academic research to back it up. In 2007, the Hospital of the University of Pennsylvania carried out a study that examined patients in their Emergency Department. They found that when patients were complaining of the same level of severe abdominal pain, men waited an average of 49 minutes before being treated, while women were forced to wait for an average of 65 minutes. That’s a difference of 16 minutes — and when you’re in pain, that’s a lot. That same study reported that women are less likely than men to receive analgesics, and when they did, less likely to be given opioids. A 1990 study by Karen Calderone dug into the medication records of patients who had recently undergone coronary artery bypass graft surgery — and what she found was appalling. When presenting with the same symptoms, male patients were given pain medication far more frequently than female patients. What’s worse, when women were treated for their pain, they were often given sedatives rather than analgesics for their pain. Diane E. Hoffmann and Anita J. Tarzian’s 2001 study, “The Girl Who Cried Pain,” revealed that doctors are more likely to diagnose female chronic pain patients with histrionic disorder compared to male chronic pain patients. And, much like Calderone’s study, they found that women were more likely than men to be prescribed tranquilizers and antidepressants to treat pain. Finally, a 1999 study uncovered the fact that men are more likely than women to be referred to specialty pain clinics after discussing pain with their doctor. Though the days of Victorian medicine and diagnoses of “hysteria” are long gone, sexism hasn’t gone anywhere. Misogynistic stereotypes paint women to be overly emotional and irrational, making it far easier for doctors to believe women’s pain has no physical basis. Men, however, are seen as being rational and level-headed. When they say they’re in pain, doctors take their symptoms seriously. 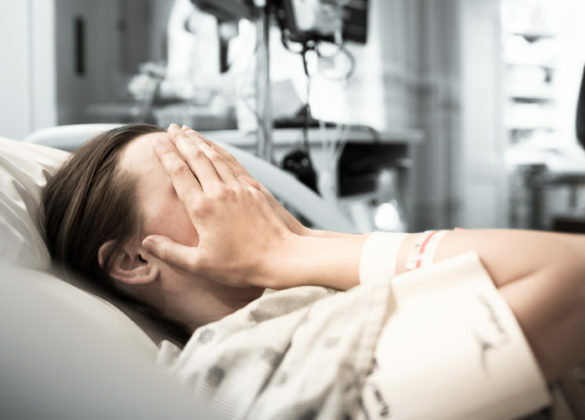 Because of societal norms, doctors may feel uncomfortable with “emotional” women, therefore seeking to stop their expression of pain through sedation, rather than actually addressing the cause of their suffering. This only serves to leave women in distress longer, as they are often too sedated to tell their doctors that they’re still experiencing acute pain. Beyond gender discrimination, there are also racial and ethnic biases in healthcare. Black women, in particular, have a harder time getting the care they need, as racial biases and false beliefs about the biological differences between blacks and whites still run rampant in the medical field. A 2016 study from the University of Virginia found that half of medical students and residents actually believe that the nerve endings of black people are less sensitive than those of white people. After reading statistics like these, it’s pretty easy to see that doctors are not only fallible, sometimes they’re just plain stupid. Since medical professionals not only take women’s pain less seriously than men’s, but often misdiagnose it as being emotional in nature, convincing our doctors to listen to us is no easy feat. Fortunately, there are a few things you can do to make sure they’re paying attention. Keep a detailed record of your symptoms, doctor’s visits, medications, hospitalizations, and surgeries. Bring it with you when you know you’ll be seeing a doctor (especially a new one). If a doctor is disregarding your symptoms or claiming they are emotional problems, you’re well within your rights to disagree. Explain why you take issue with their diagnosis and give them evidence to back up why you think they’re wrong. If you don’t feel comfortable speaking up, bring someone with you who can serve as an advocate. Patient satisfaction is becoming increasingly important to hospitals. If you have a bad experience, write a letter of concern to the hospital administrator. You know your body better than anyone else. Don’t let anyone gaslight you or make you feel like your pain isn’t real. If you know something is wrong and your doctor is failing in their duty to help you, seek second, third, fourth, or however many opinions you need. As human beings, we deserve to be treated fairly by doctors, have our pain taken seriously, receive proper treatment, and be given the same level of care as men. Unfortunately, it will likely be decades before we’re able to eradicate the gender bias implicit in the healthcare industry. Until then, we’ll just have to keep fighting.